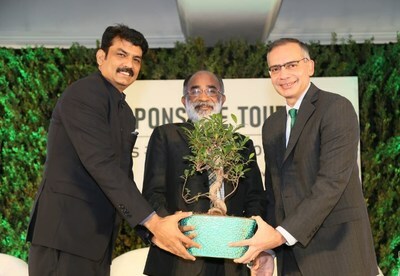 MakeMyTrip (NASDAQ: MMYT), India’s leading online travel company, has successfully supported plantation of one million trees through MakeMyTrip Foundation in Rajasthan’s Rajsamand and Udaipur districts as part of its efforts to support responsible travel. The drive has been carried out in partnership with Seva Mandir, a leading non-profit organization that works with local communities on development projects, especially focusing on sustainability. MakeMyTrip’s GoGreen initiative is a 360-degree drive that aims to promote responsible travel and environmental sustainability by involving all stakeholders including customers, employees and local communities. The tree plantation effort covering 2,350 hectares of land has been carried out with the contribution made by customers to MakeMyTrip foundation each time they have booked their flights and hotels on the platform. A public charitable trust, the MakeMyTrip Foundation has been set up to actively and passionately contribute towards issues of broader social impact, especially focusing on promoting responsible travel. As part of its charter, MakeMyTrip Foundation is investing resources and creating awareness to improve ecological balance, offset carbon footprint and support restoration of Indian heritage. The foundation supports these goals through soft skills training of local travel hosts & travel guides, training of front-line staff at tourism hot spots and its plastic waste management project that it has piloted in three islands of Andamans and Gurgaon. MakeMyTrip Foundation has also recently signed an MoU with Sonam Wangchuk’s Himalayan Institute of Alternatives (HIAL) in Ladakh for a first of its kind carbon offsetting project. MakeMyTrip Ltd. (NASDAQ: MMYT) is India’s leading online travel company. We own and operate well recognized online brands, including MakeMyTrip, Goibibo and redBus. Through our mobile apps and primary websites, travelers can search, plan and book a wide range of travel services and products in India as well as overseas. Our services and products include air ticketing, hotel and alternative accommodations bookings, holiday planning and packaging, rail ticketing, bus ticketing, car hire and ancillary travel requirements such as facilitating access to third-party travel insurance and visa processing. We provide our customers with access to all major domestic full-service and low-cost airlines operating in India and all major airlines operating to and from India, over 60,000 domestic accommodation properties in India and more than 500,000 properties outside India, Indian Railways and all major Indian bus operators.